Registration is now open for the North American Division Church Planters BootCamp East! It will take place in beautiful Camp Kulaqua, from February 28 – March 3, 2019 with the participation of hundreds of church planters from across our Division and beyond. The first NAD Church Planters BootCamp West will take place in Pine Springs Ranch, California, from November 7 -10, 2019. Registration for Church Planters Boot Camp West will launch in August, 2019. These three day experiences have been designed and created exclusively for Church Planters, Pastors, Volunteer Lay Pastors, Church Planting Core Teams, and Conference/Union Leaders currently involved in church planting or planning to plant a church between now and 2020. The benefits of attending include: practical teaching on how to plant a church from our best church planters in North America, networking opportunities and experiential learning with other practitioners who are traveling the same journey, and in-depth, direct information on funding initiatives which can help church planters navigate the first few years of a new missional congregation. Church Planting Among Refugees for participants planting churches among groups highly influenced by other religions, including refugees. Revitalizing Churches to Plant for pastors and leaders of churches that have plateaued or are declining, yet are envisioning the possibilities to plant a church in the very near future. Coaches para plantadores experimentados que desean preparar y discipular nuevos plantadores de iglesias. Revitalizando Iglesias para Plantar mas Iglesias para pastores y lideres de Iglesias que han estado estancadas o en decadencia, pero que tienen la visión de plantar una nueva iglesia en el futuro cercano. 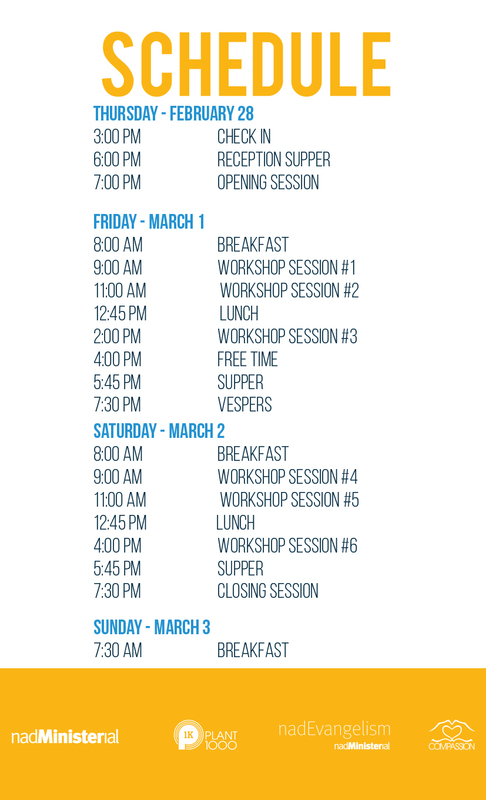 Registration rates includes access to all sessions (general sessions and workshops), materials, lodging, 9 meals, and a Plant1000 golf shirt. Feel free to share this information with people who may benefit from this experience. Please check our website, nadchurchplant.org, for more info and updates between now and the beginning of the BootCamp.